Our Zen Reflections Bonsai will bring beauty and serenity to any space. 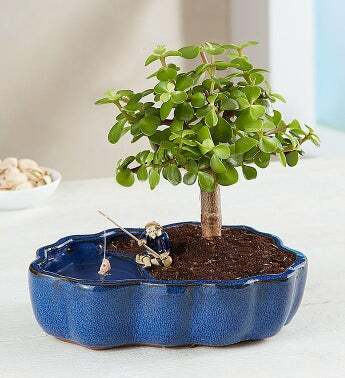 Your choice of bonsai tree—dwarf jade or juniper—is planted in a ceramic planter with dual reservoir. in one is the bonsai with a base of moss-covered soil, giving the appearance of a grassy hill. In the other, a reflective pool that mirrors the bonsai’s beautiful features. We’ve even included a miniature fisherman to add a touch of whimsy to the contemplative nature of this delightful gift. Arrives with your choice of bonsai tree: a dwarf jade bonsai or juniper bonsai; jade measures 8-10"/juniper measures 6-8"